Apikuni was Kokanee's only offspring and a very colorful fellow. Besides all his spots, he had a beautiful set of dark blue eyes (and no, he is most definitely NOT deaf!). Kokanee's milking ability proved to be marginal, so Apikuni fell substantially behind in his growth. Although his growth accelerated to normal after he started eating grass and hay, the damage was already done — Apikuni was a mere 41.5". Apikuni was conceived just days before his mother's sire, Hidden Valley Silverhawk, proved to be a choanal atresia producer. Apikuni's possible carrier status made it inappropriate (not to mention unethical) to consider keeping him intact. His mother's milking performance (or rather lack thereof) alone made him a definite nonbreeder. 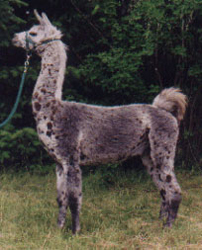 And as if that was not enough, we discovered Apikuni was also heat intolerant, even more so than his mother Kokanee, and his coat was on the border between classic and curaca — he HAD to be body-shorn — in sum, certainly not suitable pack breeding stock. Thus, there was no question: Apikuni became a happy gelding at the age of 15 months! Apikuni really fell for our farm sitter, Anne (and vice-versa), so we had decided to make their "marraige" official. Apikuni was staying with us until Anne's new place was finished being set up, and Apikuni eagerly awaited living with Anne. He was especially looking forward to HIS new barn. Despite all of Apikuni's physical and genetic drawbacks, he was a super fellow in many respects, and we were very glad he would be a mere three miles away and always available for visits ... but ... while everyone was busy making plans, life got in the way. In March of 2007, Apikuni developed a urinary stone that lodged in his urethra. It took over a week after his initial emergency exploratory surgery (that also placed a temporary bladder drain) for the stone to be located and removed during a second surgery. Because of the urethral damage done over that time, it was necessary for Apikuni to have another way to empty his bladder, and a third surgery giving him a high urethrostomy was performed. Everything was looking great and Apikuni came home to recuperate, excited to be back in familiar surroundings and out of that "nasty" concrete stall at OSU. Unfortunately, the odds caught up with him. The next week Apikuni didn't feel right and he was rushed up to OSU again. A rare post-surgical infection had set in, damaging his bone marrow. After several weeks Apikuni was beating that one, too, when he developed a highly drug-resistant pneumonia. Several days later, even Apikuni finally had to admit that it had all become too much for him, and so he was humanely euthanized. Apikuni enjoyed feeding time, being the responsible one in charge of the pasture, having emotionally stable friends and family, and especially observing as much as possible. He gained many new human friends and admirers at OSU in his last two months, and he appreciated their help very much. "Apikuni" is a Blackfoot word meaning "spotted robe"; it has no linguistic relationship to the word "appaloosa" even though everyone assumes that when they hear it. Although the name is appropriate, Apikuni kinda wished people would try to see him for himself instead of getting distracted by all his spots.